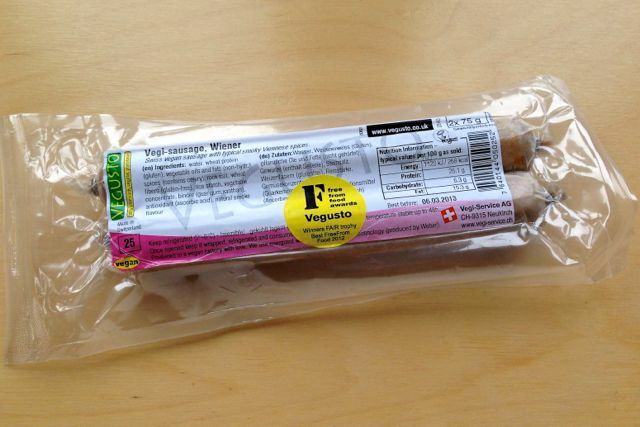 These Vegusto wieners are thicker and far meatier, being based on gluten rather than tofu. They come two per pack, in plastic casings which need to be removed before cooking. Speaking of which, there are no instructions whatsoever on the pack on how to cook these wieners. 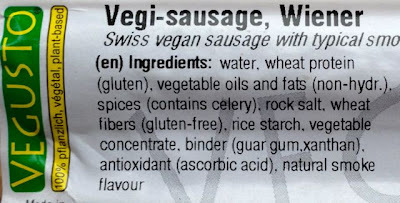 We think Vegusto assume far too much knowledge of german sausage styles and their preparation. We thought boiling would be the best option. The boiled sausages certainly turned out juicy, but still meaty. The texture is very much gluten... sort of springy and chewy, but soft enough to be enjoyable. 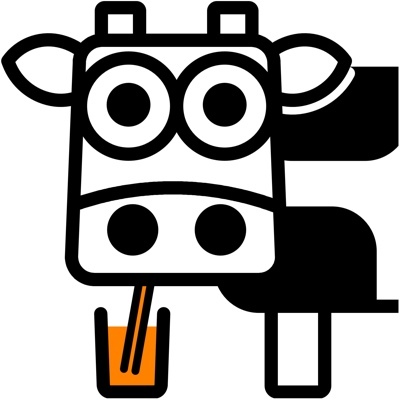 The flavour is also quite strongly gluten, with a little smokiness. 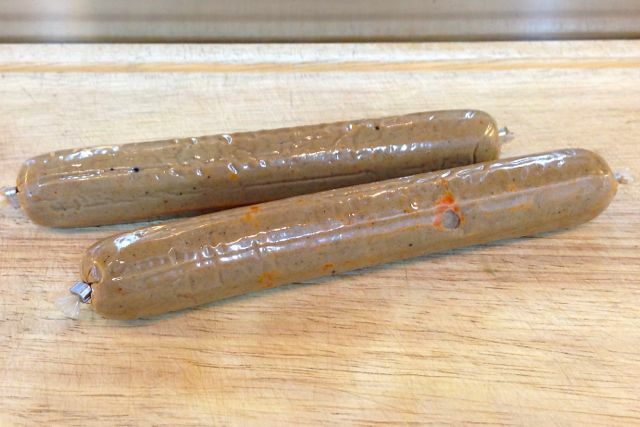 Wieners and hot dog sausages are sometime interchangeable, but we wouldn't recommend you try and eat these in a skinny bread roll...they're simply too thick for that. 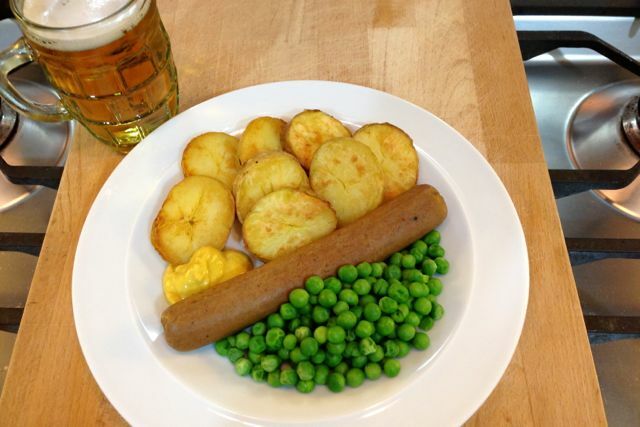 We served ours up with fried potatoes and peas, plus the obligatory dollop of senf (German mustard). 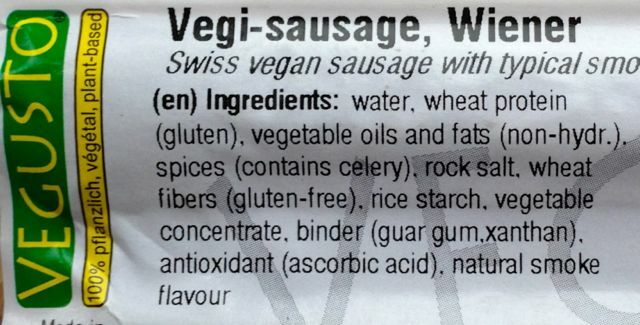 Although we think these sausages are not what people might expect if they bought wieners, who are we to argue with the Swiss? We'd certainly buy them again, as they're meaty, juicy, smoky and quite enjoyable.